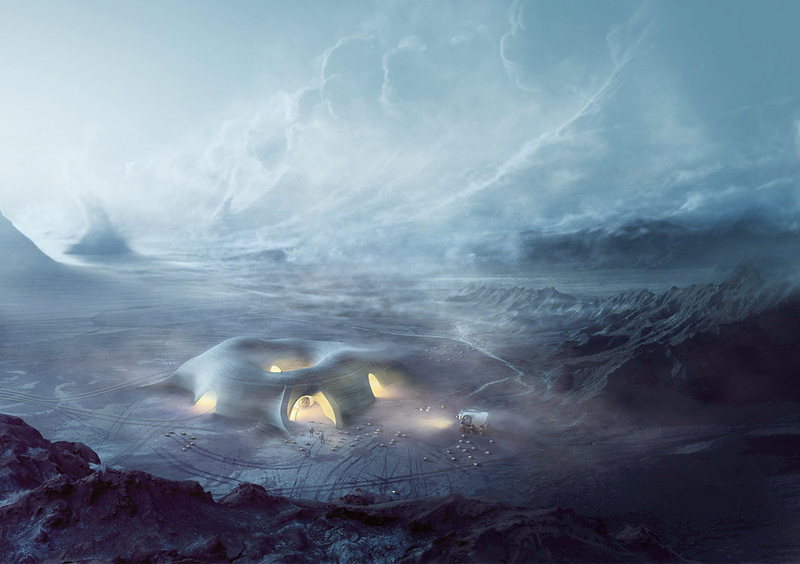 The HASSELL + EOC design for a Mars Habitat has reached the final 10 of NASA’s 3D Printing Centennial Challenge. Seeking perspectives from outside the traditional aerospace industry, the NASA competition explores how a human habitat could be designed and delivered on Mars using autonomous 3D printing technologies. Several substantial hurdles must be overcome for humans to survive in the harsh Martian environment. Perhaps most significant, the lack of a magnetic field and atmosphere leaves the planet’s surface exposed to much higher levels of radiation than those on Earth. HASSELL and Eckersley O’Callaghan partnered to design a shell, which could be constructed entirely by autonomous robots using Mars’ natural regolith, to protect the astronauts from the radiation, as well as micrometeorite strikes. “We used highly sophisticated digital design techniques to achieve a structure that provides maximum protection, while minimizing the quantity of materials required and the amount of time the robots would need to build it,” says Ben Lewis, Head of EOC’s Digital Design Team. The robots would be sent to Mars a few years before astronauts are due to arrive. 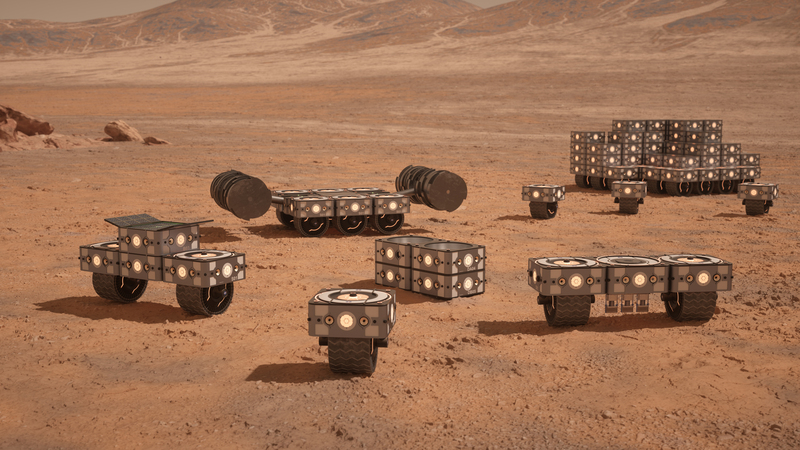 These intelligent autonomous robots will have interchangeable roles, from battery storage to scout rovers, logistics to excavation and even 3D printing units, all integrated with multiple cameras and sensors for navigation. They can reconfigure themselves for a multitude of purposes, ensuring prolonged usage beyond the initial build phases. 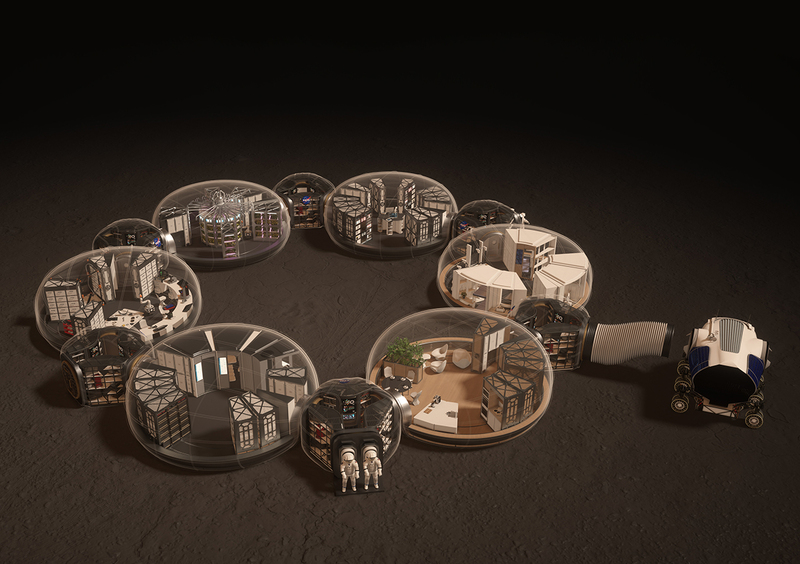 Once the astronauts land, they would rapidly construct the building’s interior using a series of inflatable pods that incorporate all the living and working requirements for everyday life on Mars. The design moves beyond the idea of astronauts purely as operators, to create a habitat where people will not only survive on Mars, but really thrive there. “The first astronauts on Mars will have travelled more than 1000 times the distance between the Earth and the Moon,” says Xavier de Kestelier, Head of Design Technology and Innovation at HASSELL. “The mission will last more than three years, which is triple the amount of time anyone has lived off Earth. Responding to the challenge that every kilogram of equipment brought to Mars is hugely expensive to transport, astronauts would be equipped to repurpose and recycle as much waste material as they can. The workshop would therefore be one of the most important spaces in the habitat. The astronauts would be able to 3D print spare parts and tools, and recycle plastics and packaging into furniture and shoes. The fabric from the supersonic landing parachutes would be refashioned into clothes. Another terrestrial approach to Mars is the installation of moveable storage racks in each pod, similar to those used in libraries and archives. While the design of each pod, be it a lab, a living room or a greenhouse, is in principle the same, this rack system personalizes them and provides the opportunity to swap out or combine functions, creating a true sense of community, rather than a series of singular structures. Overall winners of the competition will be announced later this month.